Map of the Eastern United States and Western Atlantic Ocean displayed by GeoMapApp. Click on image for a larger view. This map created by GeoMapApp displays contour information for the Atlantic Ocean. Contours are shown in 500-meter intervals along with color-coded topographic information. Latitude and longitude markings are also shown and depth data is dynamically viewable by moving your cursor. This chapter is most appropriate for students in grades 9 - 16.
hypothesize about the formation of observed seafloor features. 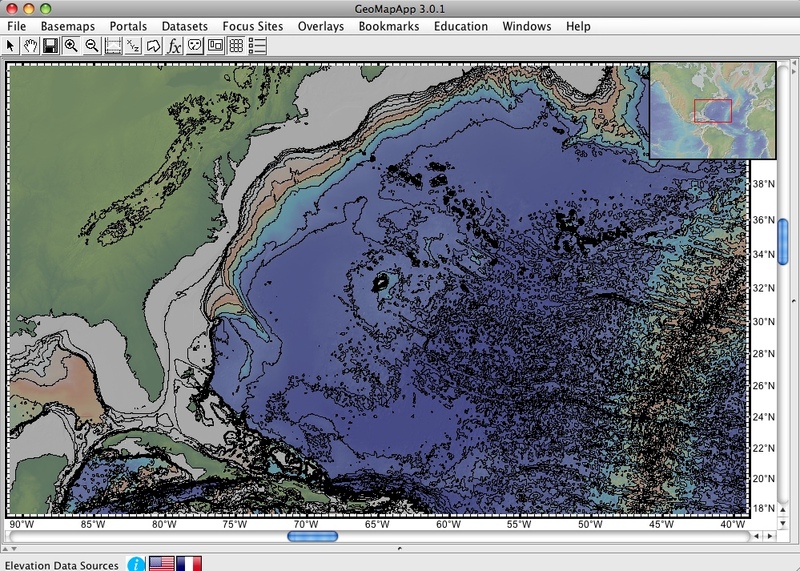 GeopMapApp is a simple-to-use, yet powerful, set of data and software that allows users to visualize the seafloor. Users learn to generate and interpret graphs that show seafloor depth versus distance. Working with these profiles can give users practical experience with scientific visualizations and contribute to their data literacy skills. High school students are usually familiar with topographic maps that show elevations ranging from zero (sea level) upward. They have also been introduced to the basic concepts of plate tectonics. However, they have generally had little experience exploring the topography of the seafloor. The bathymetric images in GeoMapApp are not satellite images or photographs, as many users may initially assume. Rather, they represent sonar data (depth measurements) that are compiled by computer software into a continuous grid. The sonar data are collected by oceanographic research ships. Displaying the grid of measurements according to a color code helps us interpret the imagery as the topography we would see if the water were removed from the ocean basins. You can find out more about the data collected by and used for marine research at the Marine Geoscience Data System site. Instructors may want to preface this activity by demonstrating how we can map something which we cannot see. Prepare a box with a familiar object attached to the inside bottom and a wide grid of small holes in the top. Probe the holes with a "sonar stick" (chopstick or other thin wooden stick that has been calibrated with color) to determine the depths to the bottom of the box across the grid. Construct a map using color to indicate the shape of the object. Replace the box top with one that has a finer grid of holes and repeat. This will show that taking more measurements will result in a more detailed map. The following questions can be used to elicit students' current understandings before the activity. How deep do you think the ocean is? Do you know how to convert feet to meters? Describe what you think the seafloor looks like. Sketch a picture. How do you think experts in oceanography know about the seafloor? Why might the depth of the oceans and the shape of the seafloor be of interest to humans? group presentation of analyses with justified reasoning. Students should form a testable hypothesis and demonstrate the logical connections between the scientific concepts guiding a hypothesis and the design of an experiment. They should demonstrate appropriate procedures, a knowledge base, and conceptual understanding of scientific investigations. 12ASI1.3 Use technology and mathematics to improve investigations and communications. 12DESS3.3 Interactions among the solid Earth, the oceans, the atmosphere, and organisms have resulted in the ongoing evolution of the Earth system. 1. How to use maps and other geographic representations, tools, and technologies to acquire, process, and report information from a spatial perspective. Scientific investigations are conducted for different reasons, including to explore new phenomena, to check on previous results, to test how well a theory predicts, and to compare different theories. Hypotheses are widely used in science for choosing what data to pay attention to and what additional data to seek, and for guiding the interpretation of the data (both new and previously available). Sometimes, scientists can control conditions in order to obtain evidence. When that is not possible for practical or ethical reasons, they try to observe as wide a range of natural occurrences as possible to be able to discern patterns. Although each discipline provides a conceptual structure for organizing and pursuing knowledge, many problems are studied by scientists using information and skills from many disciplines. Disciplines do not have fixed boundaries, and it happens that new scientific disciplines are being formed where existing ones meet and that some subdisciplines spin off to become new disciplines in their own right. Technological problems often create a demand for new scientific knowledge, and new technologies make it possible for scientists to extend their research in new ways or to undertake entirely new lines of research. The very availability of new technology itself often sparks scientific advances. Mathematics, creativity, logic and originality are all needed to improve technology. Technology usually affects society more directly than science because it solves practical problems and serves human needs (and may create new problems and needs). In contrast, science affects society mainly by stimulating and satisfying people's curiosity and occasionally by enlarging or challenging their views of what the world is like. Approximately 3 full class periods.